Simon Tisdall. Wednesday March 9, 2005. The Guardian. Unrelenting US pressure on Cuba, set to ratchet up again at next week's UN human rights commission meeting in Geneva, is testing relations between the Bush administration and a new generation of centre-left Latin American leaders. As it has done each year since the early 1990s, the US will urge the commission to adopt a resolution condemning Cuba's human rights record. And Cuban officials predict that the US will again use "arm-twisting and threats" to get its way. 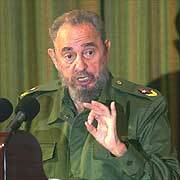 Republican attacks on President Fidel Castro's communist government intensified during last year's American election campaign. The treasury secretary, John Snow, tightened the 42-year-old US embargo and vowed to "bring an end to the ruthless and brutal dictatorship". Loyola is part of program that aims to end 1-party rule. By Gary Marx. Tribune foreign correspondent. February 13, 2005. HAVANA -- In a move likely to further aggravate tensions between Cuba and the United States, the U.S. government is offering millions of dollars to American universities and other groups under a program aimed at ending Cuba's one-party rule.= Many schools traditionally have avoided the political battle between Washington and Havana. But that is beginning to change. NPR Morning Edition, November 4, 2004 · Sen. John Kerry won among Latino voters this year -- polls say the breakdown was 54 to 44 in the Democrat's favor. But four years ago, Al Gore won 62 percent of Latino votes. Hear NPR's Ari Shapiro. First Cuban-American in US Senate! 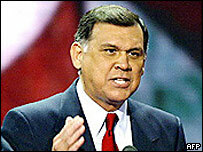 Former Republican Cabinet member Mel Martinez has become the first Cuban-American to enter the US Senate. Mr Martinez, who came to the US from Cuba aged 15, beat rival Betty Castor to the seat of retiring Democrat Bob Graham in Florida in a close-run vote. Ms Castor, a former Florida education commissioner, conceded after initially contesting Mr Martinez' one-point lead. Question: Cuban President Fidel Castro's fall following a speech Oct. 20, in which he broke bones in his left leg and right arm, brought to the fore questions about what will happen in Cuba after he is gone. Is the Cuban government prepared for Castro's eventual departure? Is the United States prepared? Updated: 1:18 p.m. ET Oct. 6, 2004HAVANA - The two young men leaned on their bikes outside a school in the Marianao neighborhood of Havana, sheltering under trees from the scorching afternoon sun, eager to talk about what they don’t like about Cuba. HAVANA, Oct. 1 (Xinhuanet) -- The Cuban government will hold six fora on the Internet on Oct. 6 to denounce the blockade imposed by the United States against the island for over four decades, according to a statement by the Cuban Foreign Ministry. The statement said that Cuban Foreign Minister Felipe Perez will participate in the event on the website www.forumcubaminrex.co.cu. It will be the third time for Perez to speak at such a forum to criticize Washington's hostile policy against Havana. Sept. 21 (Bloomberg) -- The U.S. House of Representatives voted to allow Americans to visit relatives in Cuba once a year, rejecting new Bush administration restrictions on travel to the communist island nation.